You are invited to take part in a collaborative workshop that will use discussion and playful activity to explore the limits of being an expert and the potential benefits of amateurs. The workshop, led by artists Toby Lloyd and Andrew Wilson, is free to all participants and will include a light dinner. Using Suzuki’s observation that in the beginner’s mind there are many possibilities but in the expert’s mind there are few** as a starting point to reflect and challenge our own personal experiences. The drive of this workshop is to platform unheard voices in order to collectively re-evaluate existing hierarchies and power structures. *Attributed from a 1953 essay by Philosopher Isiah Berlin, of the same title, who divides writers and thinkers into two categories: Hedgehogs, who view the world through the lens of a single defining idea and Foxes who draw on a wide variety of experiences and for whom the world cannot be boiled down to a single idea. The workshop is part of a series of ‘action research residencies’ that artists Andrew Wilson and Toby Lloyd are conducting across three northern cities, Liverpool, Leeds and Newcastle. Not interested in reaching agreement or consensus on the theme, rather the aim is to generate, collate and reflect upon opinions from diverse and conflicting viewpoints to encourage a broader understanding of the social value attributed to skills and knowledge. Once all the ‘action research residencies’ have taken place audio recordings will be used to create a short film that will be screened in Birmingham at Flatpack Film Festival, April 2016. The Film will be a central element to a hospitable public house environment that Lloyd & Wilson will construct for the duration of the festival. This environment will also host a series of events including discussions, screenings and performances. All workshop attendees will be invited to the festival to watch the film and take part in the events. After Flatpack Film Festival a screenings of the completed film will be organised in each of the three host venues. Working collaboratively since 2012, Lloyd and Wilson are currently undertaking a long-term live/work residency in South Leeds with East St. Arts. Prior to their relocation from Newcastle to Leeds Lloyd & Wilson had regularly produced multi-faceted creative projects with The NewBridge Project; most recently 37 pieces of flair which explored collective concepts of mental health by surveying the politics and culture from which the emerge. 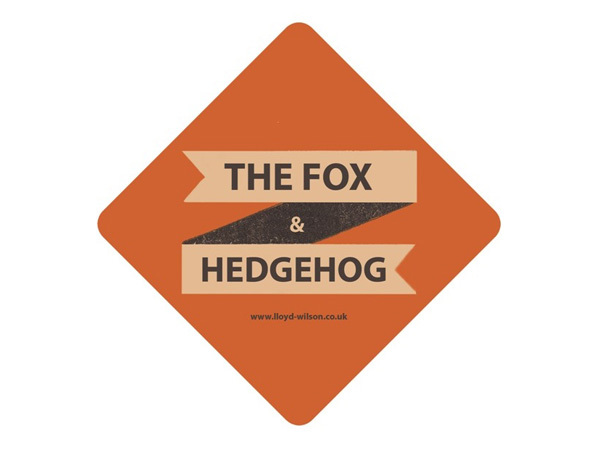 The Fox and Hedgehog has been generously supported by Grants for the Arts, Arts Council England, and has been developed with generous support from The NewBridge Project, East Street Arts, Metal Liverpool, Launchpad, Re-vision, Together for Peace and Flatpack Film Festival.